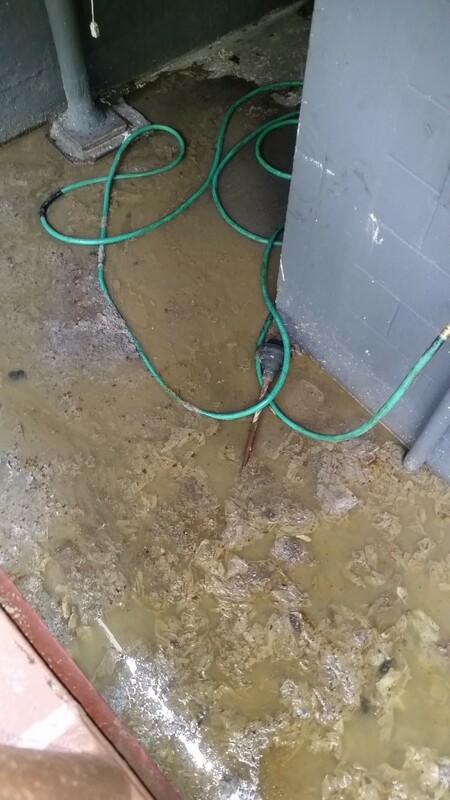 Damaged sewage can cause extremely serious problems in your home or business. Sewage water leaking inside buildings poses a serious health hazard because it is contaminated with fungi, germs, bacteria and other microorganisms which are causative agents of various diseases and disorders. It can also ruin floors, furniture, walls and electrical systems. Once the sewage problem is happened, returning the building to its normal state requires proper sewage cleanup techniques. Our certified teams of professionals are at your disposal 365 days a year, 24 hours a day. Aging sewer systems. The fact that numerous homes are connected to already wasted, aging sewerage systems, explains the increasingly frequent flooding in buildings and basements. Solid flushes. This is the most common cause of sewage problems. Dirt, hair, diapers, sanitary napkins, accumulated grease, bulky items and insoluble particles fallen into drains can cause a blockage, which leads to sewage backups. Natural disasters, such as heavy rains and storms, which can cause overflow of sewer lines. Sewage backups can lead to havoc in a home or business, causing costly damages to furniture, floors, walls, and valuables. They may even cause malfunction of electrical systems. Buildings suffered such a severe disaster could become uninhabitable. Raw sewage is often contaminated with a variety of parasites, germs, microorganisms, bacteria, protozoan, and fungi that are causative agents of serious diseases and even death. The most common bacteria that can be found in raw sewage are E.Coli, Salmonella, Heliobacter Pylori, Hepatitis, and Leptospirosis. They cause eye, nose, liver, throat, ear, and stomach infections, vomiting, diarrhea, dermatitis, hepatitis, allergy, damages to kidney and blood, aches, cramping, and even death. Sewage backups also pose an incredibly high risk of contamination with health hazardous toxic chemicals. Their inhalation or ingestion may have dangerous health effect and even cause death. The potential risk of accumulation of toxic or flammable gases within a closed space can also be dangerous for human health and can be catastrophic to the environment. Sewage backups often impair local water supply and thus create prerequisites for epidemic outbreaks. Residual moisture is a contributor to the appearance and growth of mold and thus causes secondary damages such as ruined walls and furniture, occurrence of asthma, allergy and other health issues. Once occurred, these problems are costly and difficult to remedy. Call Water Damage Repair San Francisco certified professional teams to assess the damage and repair the damaged sewage. Avoid any contact with sewage because coming into contact with the potential contaminants of raw sewage can make you sick or even cause death. In case of contact with the wet surface wear protective clothes, rubber gloves and boots. Toilets and sinks must not be used unless in case of extreme necessity. Sewer clean-out caps for the affected building must be accessible to the technicians. If no plugs are reached by water, shut off the power. Try to remove standing water with pumps. Although home and business owners can do a lot to limit the damage of sewage backup, only a professional and comprehensive team of technicians is capable to contain and safely remove sewage spills quickly in a cost effective and environmental friendly manner. The Water Damage Repair San Francisco is a team of experts whose specialized training and equipment allow to promptly and safely handle the situations like sewage backs up. Thanks to our extensive experience we are able to clean the affected area quickly and properly. When the situation is under control we make an accurate inspection and assess the safety risks and thus prevent mold appearance and secondary damages. Drying and disinfecting floors, walls and plumbing fixtures. Cleaning and disinfecting or removing wet curtains, carpets and other floor covering. Repairing or removing affected wall covering. Drying and disinfection of all affected area to prevent the spread of health hazards such as bacteria, fungi and other dangerous microorganisms. Proper treatment of all contaminated soil and building materials within the affected area. Accurate inspection to detect hidden moisture. Properly dispose grease. Never put cooking oil into the drain. Properly dispose paper products such as diapers, paper towels, napkins, feminine products, etc. Do not dispose of any scraps or large absorbent items in the sinks or toilets. Use plastic pipes to prevent tree roots from entering the sewer line. Do not use illegal plumbing systems, such as French drains, sump pumps, etc. Install and maintain a backwater prevention valve which does not allow sewage after going out of your sanitary lines to come back in.